let there be light. | escaped. I read an article in a magazine today, and I feel like being slapped hard in the face. 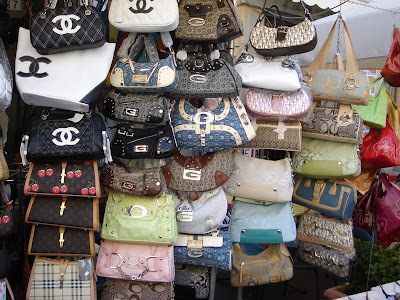 It's about the fight against counterfeit designer goods, and how child labor, terrorism and human trafficking have been associated with the said subject. Though I did buy a fake handbag once, and it happened years ago, I can't help feeling so remorseful. I feel horrible. Did you know in Thailand, there's this assembly plant(sort of a goods factory) where children of age under 10, sitting on the floor, sewing fake leather bags, namely LV, Gucci etc and the investigator said the owners of the factory had broken the children's legs and tied the lower leg to the thigh so the bone wouldn't mend, and the reason is because the children said they wanted to go outside and play. Where most consumers believe that buying fakes is harmless, but after reading this article I feel like a criminal. Though in my case it was just one time. How about those who've lived their life with fake goods? I wonder what actions have been taken over this. I saw and encountered so many shops selling fakes in Malaysia, and obviously they are illegal because one time I asked the shop owner 'what time are you closing, where did your items come from' and the shop owner resisted from talking to me after that as if I'm a police officer. Most of the shops I found are in Sungai Wang, Times Square area, and I don't think I want to go to the area ever again. Thank God there's no fake goods shop here in Japan. I think that's why when I see a friend using a LV bag to school I drool, because everything here is real. If you can't afford it, don't buy it. Carrying a fake handbag doesn't make you look graceful, and remember that fakes are never in fashion. oiii haha perli siot cis. it was this one time,zaman budak2. zaman nmpk sume nak je. but it was only once,i swear!pastu pakai tak smpi berbulan dah rosak. tu lah i hate that there are fakes yg incredibly similar to the real one,thus susah nak beza yg mana real,so people main assume je real/fake.but its the quality that counts,kan.